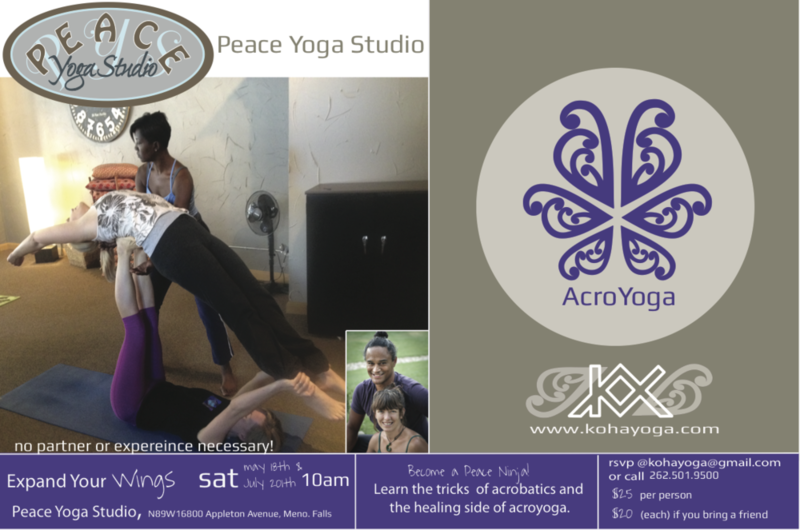 Come share the AcroLove over New Years in San Diego! All levels of acro and yoga are welcome. We have added yoga sessions throughout with access to all the yoga and beginner acro classes through the Yoga Pass. One city, one weekend, one love! The weather will be amazing in San Diego in January. This festival will be taught by over 50 amazing teachers including Whakpaingia and Sara Laimon Luke of Koha Yoga. Experience Flying and Thai-ing with Whaka and Sara of Koha Yoga and learn positions of their signature flow called the “Whaka Flow”. The “Whaka Flow” flips you upside down, stretches, and realigns your body and energy, all while being on top of someone’s feet! We will then bring the flight to the ground and learn a thai sequence to share with your friends and family. No partner or experience necessary; just an open heart! You’ve wished upon a star, but today you can become a star. We will be learning and refining our stars (the acrobatic move in the photo to the left). Once we are in a star we will press the star, walk the star up and down, turn our stars from side to side, do a 1 legged star, and maybe even turn this star into a washing machine (an acrobatic flow that starts and ends at the same point) . We will upside down the entire time, but since we will be teaching in progressions all levels are welcomed to come. You don’t need a partner, but bring friends. We have to cancel this workshop because Whaka will be out of town. Please join our next one on June 26th. Do you like to flip, expand your mind, get fit, play and get upside down? If so, this workshop is for you! In Acro a washing machine is a set of poses that start and end at the same point. Skills we will learn/ refine are: candle stick, shoulder stand, free shoulder stand. reverse foot to hand (you can see them all at acropedia.org) . This is a progressions based class, so all levels are welcomed as long as you are adventurous. No partners are needed, just bring yourself. Everyone is welcomed to come. We will be working on fundamentals and getting us strong for handstands and washing machines. You will get a killer 1 hour work out. This class is just $10! This will only be for the month of May. Everyone is welcomed to come. We will be working on fundamentals and getting us strong for handstands and washing machines. You will get a killer 1 hour work out. This class is just $10! 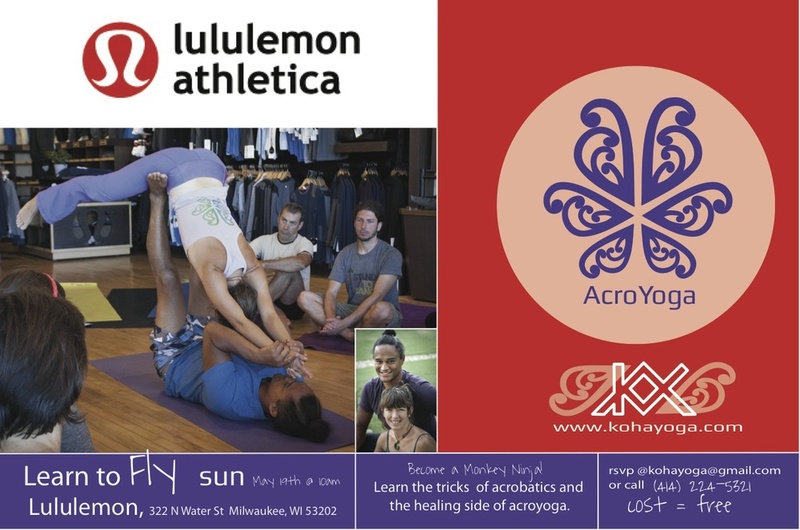 Koha Yoga, Acro Revolutionists, have been traveling the world teaching Acro and are excited to be back in Milwaukee to teach you. This is going to be fun and in just 2 hours we will be able to learn the foundations in a fresh way. We will practice principles such as bone stacking, trust, counter balancing, tempo, and alignment that provides success when moving through Acro. We will end the class with a fresh Acropeutic flow that is the healing side of AcroYoga. It is a playful way to make sure you are taking care of yourself as an Acro Revolutionary! Common Questions: Do you need experience? NO! We will be building our skills in progressions so that everyone old and new will be either refining the skill or learning it. Do I need a partner? NO! Just show up, it always works out that there are enough people in the class to balance out groups! We will take everything we cultivated and bring your yoga/movement up into the air with Koha Yoga. Using our prana, the fundamentals of Acro(batic) Yoga, and playful energy we will explore yoga including sun salutations, standing postures, and some fun twists on top of someone's feet (and hands). This workshop is for everyone, no partner needed, just a sense of exploration and adventure. We will explore all three elements of AcroYoga (yoga, acrobatics, and Thai Massage) in this Invivo Wellness evening workshop. This is the perfect way to end your week or kick-start your weekend. We will do partner poses that open up the body to fly, You don't have to be a Yogi, you don't have to bring a partner, all you need is a sense of adventure. If you have come to our workshops in the past I promise you learn some fun new playful tricks. Seems like Fox Point is not ready for us, but we have lots going on in MKE area and even Madison. Fly to New Heights for the summer solstice. We will be exploring the fundamental of acroyoga. We will be doing fun partner poses, core strengthening exercises, challenging (yet doable) acrobatic & therapeutic flying. Most likely we will explore, front flying, back flying, and a few transitions and maybe even a washing machine. You don't need a partner or even experience, just show up with a desire to learn. explore various acrobatic flying positions and the transitions that link them together. To participate in this workshop series come with; (or by our permission): Back Plank, High Flying Whale, Free Bird, Throne, Shoulder Stand. Learn to Fly "Free" with us on Sunday May 19th @ 10am. We will be doing a fundamental AcroYoga class and becoming the Monkey Ninja you always wanted to become. No need for a partner. Just bring yourself and the willingness to have fun. More Information about Lululemon is here.